Let’s encrypt – is a free service from google, who allows issue SSL certificates for web projects. Letsencrypt has its own API, through which easily automate the process of re-issue of certificates at the end of their period of validity. Each certificate issued Letsencrypt valid for three months. After that you need issue it again. However, this may occur automatically. Letsencrypt has many implementations to access its API. There is clients written on perl, python, C, bash and also browser clients. I decided use the most simple solution – shell-script called acme.sh. He is able to do all the required things, and does not require installation of additional software system, which is often quite difficult for older systems like FreeBSD. As described above, we will use acme.sh script. It is compatible with FreeBSD and all popular distributions of Linux. No need to install additional software, libraries and interpreters. –install command adding to actual user cron task, which will run few times per week for update sertificates and itself. lets’encrypt ssl sertificates valid 3 months, so cron task is a really important one thing here. I’d recoment do it from user, which can use web-server. For example www-data, or www. or nginx. It depends from your server settings. Anyway it must have write acces to your website directory. Below – few fays to get sertificates for domain, and ways to authorise your domain in acme servers. First method – most useful and simple, it allows to get a valid one sertificate for your website immideatley. In two words it is script which sends request to get sertificate for domain, and in the same moment generates csr-request. The server acme answers and give to our script some code, that must be seen from our server and domain. Finally acme server will connect to your domain, find there html-file with code that was sended to script and make auth succeful. 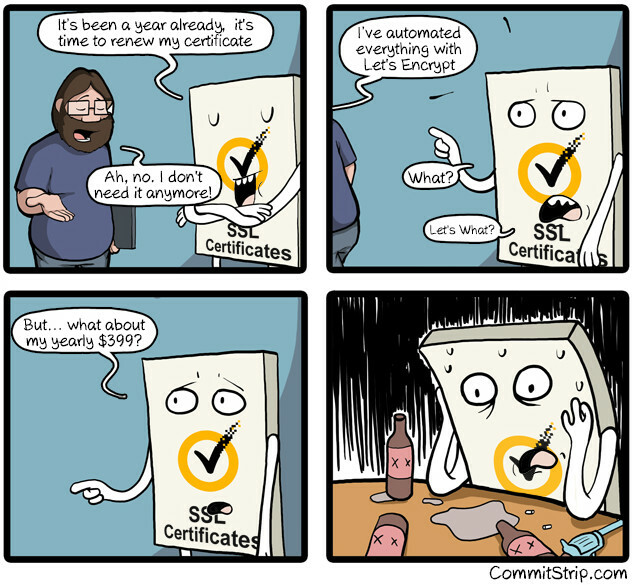 After that, you will receive ssl-serteficate. As you can see from command above, we ask script request with –issue key, for domain with -d key, -w declare our project folder. And because of that really important to make sure, that user, from which you ran script can write to website folder. After success authorisation, this file will be deleted by script automaticly. So. i’d like to say that it apears in website folder just for a few seconds. After command run, in script folder, you will see sertificates: fullchain.cer – serteficate, а erdees.ru.key – key for that. Our serteficate have all needed intermediate and root serteficates, and works without password. So no necessary to do somethinf more – just add it to ypur web server an enjoy your ssl. Please add those txt records to the domains. Waiting for the dns to take effect. acme will check dns record of your dns, and if we did al things correctly, script will give you serteficate. Next steps will same as in first recipe. You will receive serteficate, so time to turn on web server back. Script has many useful and good options. You can show all of them – just type –help. Frome good options script supports update, and also has parameter –sertpath, which allows copy sertificates to nginx folder, for example. While you make request typing command in acme.sh script, you can use -d key and create request to many domains in one time. In 5-10 domains, if you necessary. Script creates to actual user cron task, which will run few times per week for renew sertificates and update itself.